2019 - 2021 | Fearless Girl is now on display in Federation Square. A faithful reproduction of the bronze statue by artist Kristen Visbal has been unveiled in Melbourne, standing tall with hands on hips. The replica statue will temporarily stand in the city as a symbol of gender equality. Fearless Girl was unveiled in Melbourne's Federation Square ahead of International Women's Day on 8 March 2019. The 1.27 metre bronze statue - which has become a symbol of gender equality and female empowerment - depicts a young girl standing defiantly with hand on her hips. The original Fearless Girl is located opposite the Charging Bull on Wall St in New York. The reproduction statue is also by artist Kristen Visbal. The famous Fearless Girl statue is this week making her way to the city for International Women's Day on March 8, 2019. She'll be placed in Federation Square for two years before finding a permanent home. The statue is one of four - the original opposite the Charging Bull on Wall St in New York, and the others in Oslo and Cape Town. 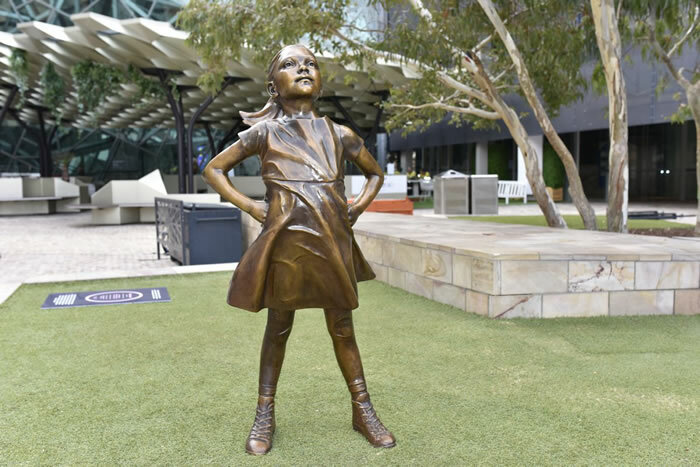 It is being brought to Melbourne by lawyers Maurice Blackburn and industry super funds HESTA and Cbus, as a symbol of the fight for gender equality. Victorian Women's Trust executive director Mary Crooks said the statue would trigger 'energy in cities and towns across Melbourne to honour women and to have public pieces that signify their past and present contribution' .